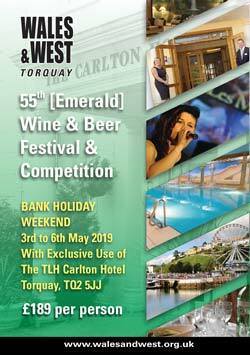 Our 2018 event just finished hosted amateur enthusiasts from across the country in Torquay, for tutored wine and beer tastings and a 1000 entry competition and full bank holiday weekend entertainment package. The Wales and West Federation of Wine and Craft Beer Makers is an organisation based in, as the name suggests, Wales and the South West of England. Our prime function is to organise one of the largest Festivals in the UK and to act as a communication centre for social groups interested in tasting and learning about wine or beer, craft brewing groups and amateur wine circles.